The team will see through this smear campaign. I did take said pants and will wear them proudly as part of this team. I am advocating a better look for all but will put the team above myself if unsuccessful and wear the issued gear. Keep the new regime from becoming a dictatorship and speak up for what you want. By the way, I saw Charlie kick a kitten once. Just saying. It looks like Karl didn't use the buy one arm tan get the second free at twinbrook Tan... 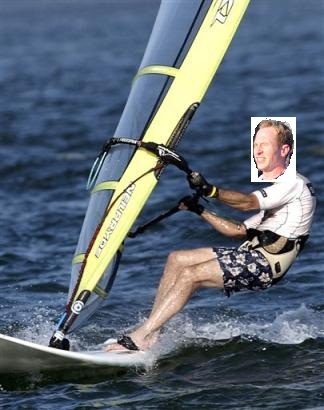 He went to the bank on his new windsurfer! My time on another team's apprenticeship program is a matter of public record. I did what was asked of me, though those particular tasks were not always honorable.